The main team in Rogue One comprised six characters: pragmatic leader Cassian Andor and his faithful robot compainion K-2SO, the rescued Jyn Erso, battle couple Chirrut Îmwe and Baze Malbus, and Imperial defector/totally-not-an-undercover-spy Bodhi Rook. Hasbro only ever made five of them in the 6" scale (and the only way to get the 3¾" version was to order an entire case from Entertainment Earth), leaving the team forever incomplete. It's not like we were asking for a "young Mon Mothma" figure or anything, this was a main cast member, being left out entirely! 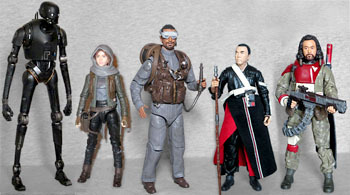 Good thing the Disney Store-exclusive Star Wars Elite Series didn't drop the ball, too. Because toy licensing is often highly specific and carefully divided, Disney's Elite Series could not be a perfect match for Hasbro's Black Series - things had to be changed. So the figures are done in a 6½" scale, and instead of plastic, they're die-cast metal. So get ready for an overly tall, weirdly heavy action figure! Seriously, this thing weighs at least a pound, if not more. He stands more than 6⅜" tall, which isn't vastly larger than the other figures - we're not talking about the difference between Marvel Legends and Marvel Select or anything - so if you just want to pretend Bodhi's a slightly tall guy, you can integrate him. The sculpt on the figure is a little bit soft, but how much of that is a stylistic choice and how much is a reality of casting a figure from metal could be up for debate: remember, plastic is, by its very nature, at least partially flexible; thus, pieces that could be pulled from a mold if cast in plastic may have been locked in forever if cast in metal. So perhaps the wrinkles on his jumpsuit aren't as thick or as crisp as they might have been. 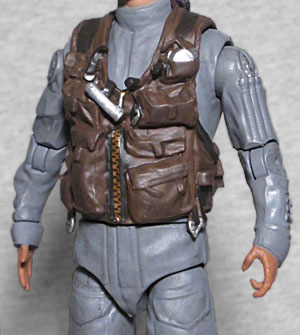 However, his vest is made from plastic, but there's no noticeable jump in quality between the two materials. Bodhi was played by Riz Ahmed, and wow, remember when the internet's saddest boys were complaining about the diversity in this movie and not... whatever it is that set them off about Last Jedi? A more innocent time! [Haters gonna hate, racists gonna race. --ed.] Anyway, this toy's likeness is surprisingly good, with the narrow face, sleepy eyes, and painted-on stubble. 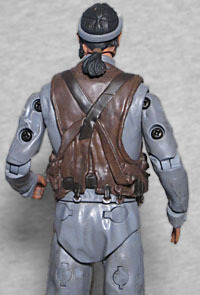 Bodhi's accessories include his goggles and a backpack. The goggles fit on his forehead, but honestly could have been sculpted on - it's not like he really takes them off or puts them over his eyes, they just rest there like a headband. 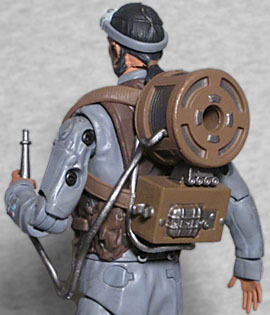 The backpack is the big coild of cabling he used to set up the communications relay while everyone else was fighting. You can remove the piece (the left strap unplugs by the shoulder, so don't feel you have to wiggle it down off his arms), and the big data plug can fit into a clip on the side so he doesn't have to hold it forever. Very nice! The Star Wars Elite Series figures retail for $26.95, which is unquestionably excessive - if making your toys out of metal means they cost nearly $30, then don't make them out of metal, stupid. Nobody wants that anyway. But on the day I went to get Marvel Select Thanos, the Disney Store had Bodhi on clearance for $1.99 - and was also having a "bonus 75% off final clearance items," and let me tell you, dear readers, this figure is absolutely worth spending 50¢ on! Heck, he's good enough that I probably wouldn't have minded paying the full price of two bucks for him, either!